We love NYFOS in the Winter; We love NYFOS in the Fall; We love NYFOS in the Springtime when it drizzles; but there is no NYFOS in the Summer when it sizzles, at least not here in NYC. So last night's cabaret at Henry's was a bittersweet moment since all the singers we love from Juilliard are going their separate ways. NYFOS at the Kaufman Center is a somewhat serious affair with opportunities for learning, although there is plenty of fun to be had. NYFOS at Henry's Restaurant on the Upper West Side is strictly fun. Gifted young artists perform songs you already know and love--WITHOUT AMPLIFICATION!!! Mr. Blier has coached and brought these young artists to pitch perfect performance. Tonight's theme (there is always a theme) was "Great American Songwriting Teams". Speaking of fun, Aaron Mor's delivery of "The Sheik of Avenue B" complete with Yiddish accent, was priceless. This Kalmar & Ruby song sends up the Sheik of Araby from silent film days. Think Fanny Brice and Yiddish theater! On a more serious note, Amanda Bottoms performed the Rodgers & Hart paean to urban loneliness--"It Never Entered My Mind". It's a soulful song and Ms. Bottoms invested it with a great deal of soul. A late song by The Brother Gershwin "I Was Doing All Right" was sung much better than "all right" by Hannah McDermott in jazzy style. The romantic "You and the Night and the Music" by Dietz & Schwartz was beautifully sung by Alex McKissick in both English and (surprise) Spanish! This was new to us and we loved it. Spanish is just so much more romantic than English! Tiffany Townsend sang "Blue Grass", also by Dietz & Schwartz, from Inside USA, a song associated with Pearl Bailey. It had a nice bluesy feel to it. From Sid Caesar's Little Me, James Edgar Knight performed "Real Live Girl" by Coleman & Leigh. This gave him ample opportunity to display his prodigious comic chops. Given more serious material, Theo Hoffman sang "Blue", William Bolcom's setting of some intense text by Arnold Weinstein, dealing with the positive impact on the latter's life by his practice of meditation with a well known guru. Autobiographical material is difficult but Mr. Hoffman rose to the challenge and succeeded. This was no less that we would expect from this gifted baritone. Maltby & Shire's "I Want it All" from Baby is a jazzy number sung by three women in an obstetrician's office. The performance was somewhat hampered by poor diction and only the words of the "hook" were comprehensible. We thought it might be because of our seating way off on the side but we'd had no problem understanding the male performers. We particularly enjoyed the ensemble numbers. The opener was the upbeat "Lucky Day" by DeSylva, Brown & Henderson. Although it dates from the Roaring Twenties there is nothing dated about the sentiment. For "Wrong Note Rag" from Comden & Green's My Sister Eileen, the company enjoyed four-handed piano with Leann Osterkamp joining Steven Blier. Similarly for "Ascot Gavotte" from Lerner & Loewe's My Fair Lady, one of our very favorite Broadway numbers. The song pokes fun at the British aristocracy and is delicious in its wit. The evening ended with Leiber & Stoller's "Love Potion #9" but there was more to come with an encore by Comden, Green & Bernstein--"Some Other Time" from On the Town. Mary Birnbaum directed the show and Adam Cates choreographed. 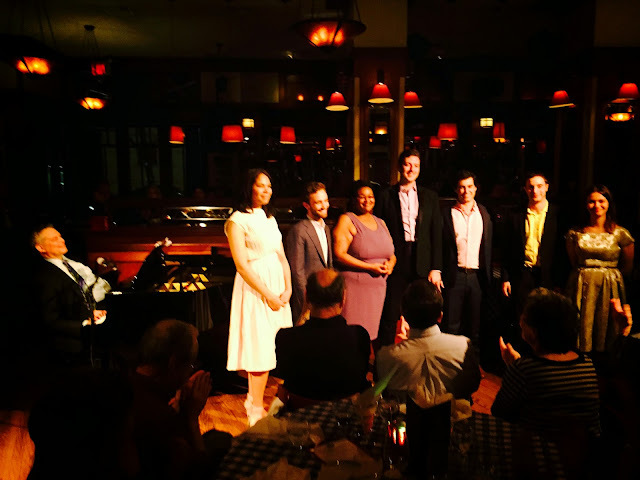 It wa a fine and fitting ending for NYFOS' fifth season at Henry's. We are already looking forward to next year.